A supporting structure consisting of a wooden framework on which is mounted the IRON FRAME (or plate), that reinforces the instrument, carrying the SOUNDBOARD and STRINGS. The materials for this structure can be a hard or soft wood such as Mahogany or Spruce. The technical problems of producing an IRON FRAME strong enough to bear the strain of SOUNDBOARD and STRINGS, without at the same time being too heavy, has necessitated the use of, in may cases, a solid wooden frame. In recent years there has been a design trend to increase the strength of the IRON FRAME and to remove the wooden back frame (BACKLESS CONSTRUCTION). Increasingly present day piano manufacturers are returning to a redesigned WOODEN BACK FRAME. This is sandwiched between the iron frame and the back bracings, it is the amplifier of the strings to make the sound audible. It does this by moving a large quantity of air towards your ear instead of only a small amount that a thin string would. The soundboard is rectangular in shape with possibly the top left and bottom right-hand corners cut away. If so these spaces may be filled with dumb boards which help secure the edge of the soundboard but don’t amplify the sound. The soundboard is about 9 mm thick and made from as many as 12 separate boards glued side by side with the best board in the middle. Usually the boards run from the top right corner to the bottom left of the soundboard along the line of the long soundboard bridge. Sitka spruce, Swiss pine or Norway spruce are the softwoods used to make soundboards because they are light, elastic, relatively free of knots, regular grained and conduct sound fairly well. Sound travels 4 times as fast along the grain as across it. If you laid a soundboard onto a flat surface you would find the centre of it would be slightly raised like an upside-down saucer. This is the soundboard crown or buck. The centre of the soundboard bends out towards you as you are sitting at the back chipping it. It is there to resist the flattening effect of the strings pushing down on it through the years via the soundboard bridge. If the soundboard goes flat or concave, strings don’t resonate so well. You will get a loud initial sound which quickly decays. The edges of the soundboard are glued to wooden fillets which in turn are glued to the back bracing. The soundboard ribs or belly bars are strips of wood glued and screwed to the back of the soundboard to give it strength to help maintain the crown or buck. They are made of the same wood as the soundboard, Sitka Spruce, Swiss Pine or Norway Spruce. Their ends are scalloped to reduce weight where the soundboard does not need support because it is already fixed at the edges. They run across the grain so may help in transmitting vibrations across the board as well. Belly buttons are wooden washers (plastic also) for the screws which fix the soundboard bridges onto the front of the soundboard. The bridge strap is a small hand-size wooden block found between 2 of the treble belly bars. It is an “underpass” for the energy going down the long soundboard bridges because the long bridge is cut into to allow the iron frame to seat down. It may or not be present. Items found on the front of the soundboard. 1. Soundboard bridges, there are 2. The long bridge serves the strings in the tenor and treble sections and the bass bridge which serves the copper covered strings. The long bridge runs diagonally from the top right of the soundboard to the bottom left along the central board. At its beginning in the treble its base is undercut so it does not go right to the edge of the soundboard. This feature makes it more responsive to transmitting vibration. The Bass bridge lies below the long bridge and is usually of the suspended variety. That is the bridge is in 3 sections; its base glued and screwed to the soundboard, a shelf which is glued onto the base, and the bridge proper which is glued onto the shelf. The reason for this structure is to bring the base of the bridge away from the inflexible, unresponsive edge of the soundboard towards the centre yet maintain a long bass string. This feature improves the resonance of the bass strings. Both long and bass bridges are made of solid quarter sawn beech as this wood is resilient to the bridge pins splitting it. Though sometimes the bridge may be made of a pine base with the quarter sawn beech as a three eighths of an inch capping. Some modern pianos may have ply soundboard bridges. You will notice that the mild steel bridge pins are angled over so the strings are gripped against the bridge for firm contact and also the string is pushed off course by the 2 bridge pins being staggered again to give a firm contact. This amount of displacement is measured as an angle and is called the side draft angle. Both bridges are glued and screwed to the soundboard and their function is to pass on the energy of the vibrating string quickly and efficiently to the soundboard. This is the third major assembly of the chipping back, it is found on top of the soundboard touching it only around the perimeter never in the centre. Its function is to resist the pull of the strings which would like to pull the top and bottom edges of the frame together. It is a network of cast iron bracings set at the required angles to best resist the tension of the strings. Instead of cast iron being used, nowadays spheroidal iron may be used which is stronger and in fact used in backless pianos. Some frames may even be aluminium alloy. A full iron frame covers the whole of the wrest plank whereas the old three-quarter iron frame only goes up to the wrest plank. 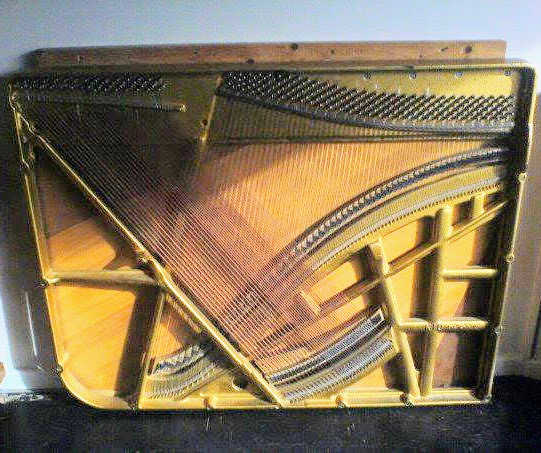 Modern pianos have webbed iron frames which means they completely cover the wrest plank apart from the holes drilled through for the wrest pins themselves. A full iron frame which is not webbed merely goes around the perimeter of the wrest plank and could be called an open iron frame. Iron frame screws which screw the frame onto the back bracings. Made of mild steel and may be as long as 6 inches. They may have countersunk, raised or round heads or if the head is hexagonal it is called a coach bolt. A pillar bolt is an iron frame screw that supports one of the bracings of the frame and it goes through the soundboard near its centre to get into the back bracing. The pressure bar is found just above the top bridge in the tenor and treble sections. It is half round in section and screwed into the bottom of the wrest plank by many raised headed screws. The pressure bar is usually made of solid brass because it will not rust or mark the strings, however mild steel is also used. Its function is to push the strings firmly down onto the top bridge to give a well defined speaking length. Wrest pins made of mild steel with a very fine thread which is gripped by the many thin layers of the wrest plank. Made in various lengths 51-64 mm and of various diameters 6.75-7.75 mm. They may have a blue enamel paint on (blued) or be nickel plated. The top bridge is the upper extremity of the strings speaking length. It may be a ridge on the iron frame itself or a brass strip lying on the frame. In the bass section there are top bridge pins angles over like a soundboard bridge pin to hold the string at its base so a pressure bar is not needed. A note with only one string is called a monochord; with 2 a bichord; with three a trichord. Monochords are the first notes on the piano, perhaps the first 14 or so notes. Bichords are the next few notes of the tenor section. Thereafter the notes are all trichord up to the last top treble note. The bass strings are copper wound to make them heavier without making them too inflexible, the copper winding gets heavier the lower down the piano you go. In fact the first monochords have 2 windings of copper and are called double wound. The remaining bass strings are single wound. Copper is a soft metal which weighs the string down and lowers its frequency without increasing the length of the string. The core of the bass strings is made from high tensile steel which is much stronger than mild steel allowing the strings to be put under as much as 200 pounds of tension. The trichod strings are also made of high tensile steel. The idea of having 1, 2 or 3 strings per note is to attempt to equalise the volume of each note. Please note the “Speaking length” of a piano string is the distance between the top bridge and the top soundboard bridge pin. Bearing cloth is found between the strings and the iron frame to provide a cushion between the 2 items. This occurs just above the pressure bar and just above the hitch pins. Hitch pins are hammered into the iron frame and then bent over, made of mild steel and may have a hitch pin washer on them. Listing cloth is found weaving in and out of the non-speaking lengths of the string to stop unwanted vibrations building up. These lengths are between the pressure bar and the wrest pins and the bottom soundboard bridge pin and the hitch pin. Wrest pin bushings are wooden (beech) or synthetic inserts between the wrest pin and its hole in the iron frame. Action bolts are long screws going through the iron frame into the back bracing. They have a threaded head as they receive the tops of the action bolts. They are made of mild steel and may be 2 or 3 in number.